But that is not so. The grow closet we have designed is "turbo" air-cooled by an exhaust fan at the top (hot air out) and inlet holes in the bottom (cool air in). The temp inside the box stays in the optimum growing range for warm season plants like tomatoes, peppers, beans, cucumbers and medical herbs. Make some strategically placed holes in the cabinet panels. Install a simple exhaust fan. Build the bubbler base unit from a plastic bin. Sit the bubbler inside the closet/box. Plant 6 of your best seedlings in it. Hang a lamp in the top. Automate everything on a timer. Open door daily to see how many inches the plants grew overnight! Our bubbler system calls for an 18 gallon nutrient bin. Don't buy a 10 gallon unit. Not only will you be refilling it too often, the roots go a little crazy in there, and need a lot of room. The dimensions of our recommended bin are a roomy 16" X 24" X 16 1/2" tall. Our plans call for a powerful little pump which pushes the grow juice up to each pot via spaghetti "feeder" tubes. We also suggest a separate aerator pump and stone to keep the roots and nutrient well-oxygenated. Some units out there do not provide a feeder, just the aerator stone. Not a good setup; you would have to topfeed the plants several times daily by hand if you don't have a feeder pump and manifold like our plans do. And you will not get the rapid growth continual feeding promotes. Some systems only have 2" or 3" net pots. Our system advocates six nice-sized 4" pots. Now, about your lamp... We want to give you some straight talk here. Some of the cheaper hydro kits throw in a fluorescent lamp and bulb with their hydro unit,so they can call it a "complete kit". Now a fluoro lamp will work fine if all you want to grow are kitchen herbs, lettuces and greens... But, if you want to grow a top-notch garden for flowering or fruiting crops, you will need to buy an HID lamp. Why buy an expensive lamp for your new garden? 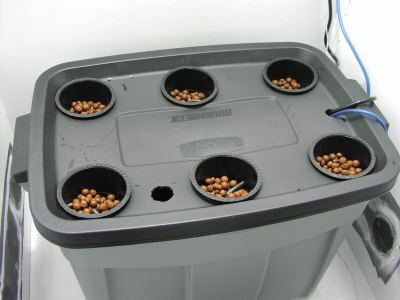 You'll have to provide special supplemental lighting for your hydroponics garden. And you'll soon find that this component of your system is likely to be the most expensive part. An evil necessity! One of the bonuses included with this e-book is instructions for setting up CO2 supplementation. This is another good reason to buy an HID lamp. CO2 supplementation will not work under fluorescent lighting... it takes HID in order to process it. Hold on, it's not that bad! There's an ingenious solution. Why do I need 2 different lights? Hydroponics growers worldwide consider the best way to grow flowering plants is by vegetatively growing them under the bright white light of the METAL HALIDE, then switching over to the HIGH PRESSURE SODIUM’s super bright orangish/red spectrum for the flowering stage of plant growth. The MH grow light bulb provides lush, compact plant growth. The HPS grow light bulbs spectrum mimics that of the "harvest sun" and promotes explosive, prolific flowering of plants. Good news: You can read about a special offer dual combo lamp which allows both bulbs (included) to use one lamp. Voila! A Hydroponics Grow Box Support Team? SUPPORT: Why buy from us? We saved the best reason for last... we provide the best support that you will find. *Free email support- email your questions, attach a photo. We will get back to you quickly... often within an hour or two. We stay on top of our email! *Website support- you will likely find some answers at our website, and can post to the Hydro Forums for more general questions. Simon's Super-Charged Turbo-Cooled Grow Box EBOOK- Price: $15.95 USD. This is a pdf file, instant download worldwide, with complete plans and parts list for making the grow box and bubbler system. We tell you step-by-step how to make this baby and where to find everything you need. Included are growing instructions, and tons of color photos and diagrams. Plus the bonus CO2 enhancement program. Hydroponics Grow Box not your bag? Or why not build a 24-pot open-air system. 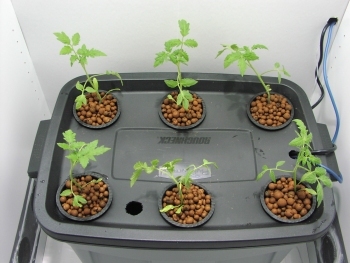 Learn how with another one of our great ebooks: Simon's Simple Hydroponic Plans.